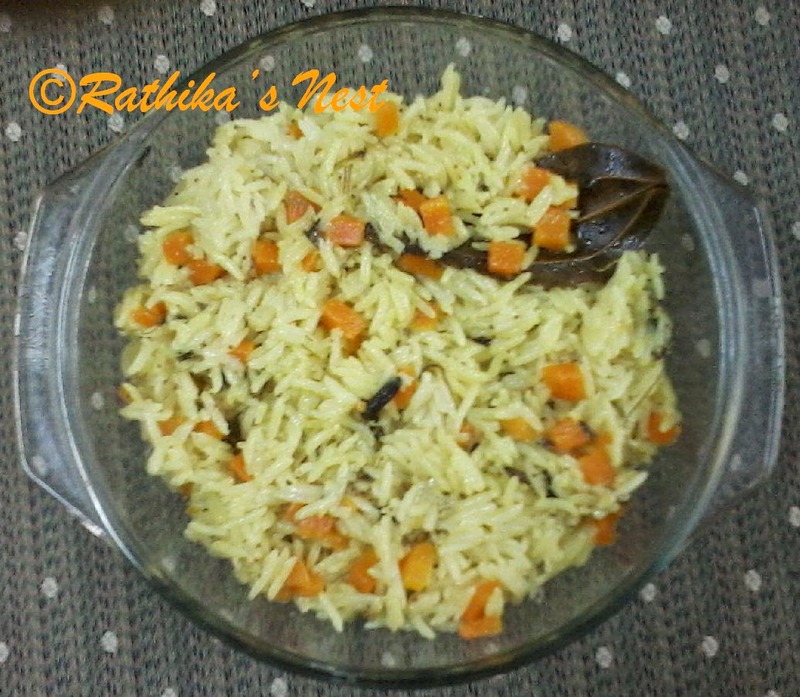 Carrot pulav is a tasty, healthy and an easy-to-make recipe. It is ideal for packing in your kid's lunch box as children enjoy eating this pulav. You can also prepare it as part of your special dinner menu. Here is the recipe. Method: Wash and cut carrots into small pieces. Chop onions and slit green chillies lenghth wise. Wash basmati rice in water and keep aside. Grind coconut with ¼ tumbler of water (50ml) into a very fine paste. Add another ¼ tumbler of water (50ml) to the paste, mix well and strain through a strainer into a bowl. Squeeze the coconut residue left in the stainer with a spoon to extract coconut milk. Keep aside. Heat oil in a handi or pressure pan, add cardamom, cinnamon and clove and saute for a minute. Now add poppy seeds and bay leaf and saute for 30 seconds. Add onion pieces and fry till they become transparent. Add carrots and fry for a minute. Now add the washed rice and fry for 1-2 minutes. Add green chillies, coconut milk, 1 tumbler (200ml) of water and salt. Mix well. Cover the handi or pressure pan and cook for 6 whistles or 6 minutes. Switch off the fire. Allow the pressure to subside. Open the lid and remove the green chillies. Add ghee and gently mix with a fork. Garnish with coriander leaves. Serve hot with raitha or vegetable kuruma and chips.